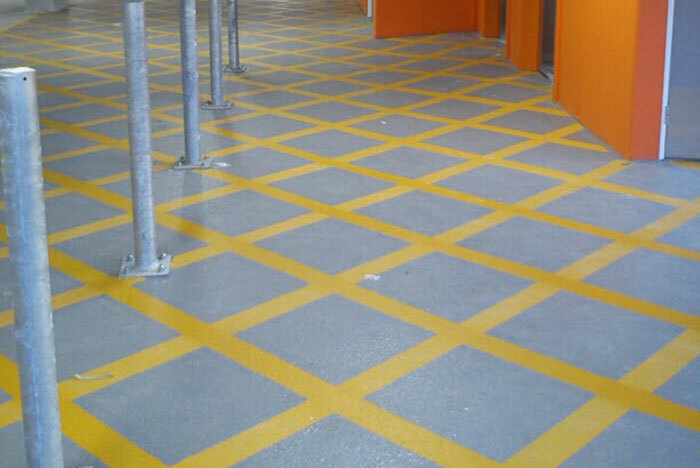 Line marking for resin flooring lets you keep pedestrians and vehicles apart, highlight safe routes for different kinds of traffic, or just make the floor look the way you want it to with graphics, logos and so on. Our resin line marking is seamless – it can be added at the same time that the liquid resin is poured, so there are no raised edges that could split, peel or create a trip hazard in the future. Line marking is the easy way to show traffic where to go, whether that means employees and visitors on foot, or vehicles like delivery lorries and forklift trucks. Remember that resin can be used indoors, outside and across the boundary between the two, and with the right line marking you can clearly show where it is safe to enter and exit a building. You can also show where people and vehicles must not go, with instantly recognisable cross hatching and no entry signs embedded into the resin, and ‘keep clear’ areas around fire exits and other crucial routes. Plan and use your floor space more effectively from the moment it is laid. Meet health and safety requirements for both employees and members of the public. Keep evacuation routes, fire exits and hazardous areas clear. Direct vehicles along safe routes to reduce the risk of a crash or other accident. Show new visitors where to go on arrival. Line marking does not have to be done at the same time that the liquid resin is poured – it can be added at a later date. Epoxy paints and resin screeds allow for a high quality finish, with high contrast and bright colours for instant visibility. Just as with line marking that is done at the time the surface is poured, these epoxy paints give a very smooth finish with a hard wearing surface that will not split, crack or peel off with time. Where needed, we can mix aggregate into the paints, to allow areas to be given a texturised finish for improved grip under foot and tyres.